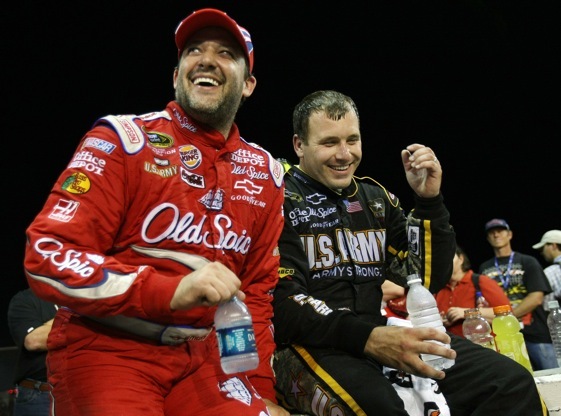 Six of the first seven finishers in the Southern 500 were Hendrick related and five of the top 11 drivers in the points standings, including leader Jeff Gordon, are either with Hendrick Motorsports or Stewart-Haas Racing, which gets technical support and engines from Hendrick for drivers Tony Stewart and Ryan Newman. The lone struggler in the group is Dale Earnhardt Jr. who is 18th in the standings, with just one top-five finish, a runner-up at Talladega. He has finished 20th or worse in four of his last five starts. Hendrick driver Jimmie Johnson, who has won the past three championships, cautions that it’s too early to say the championship this season will be settled among the Hendrick team and its affiliates. “We’re all very proud of what our equipment has done [but] it’s just too early to tell,” he said, adding that Hendrick’s success is due to having both good equipment and good people. Newman said that depth is a lot deeper now that he and Stewart are somewhat in the Hendrick fold and their teams are swapping information with the folks at the home team. “I’m sure they look at our notes just as we look at their notes so that there’s a true two-way street there, the essence of sharing information, making it a performance gain for both organizations to be united,” he said. Johnson said he and his No. 48 team haven’t done a lot of interacting with the Stewart-Haas group, and haven’t turned to them for hints on finding more speed, but he does see the benefits that come with the arrangement. Knaus said there’s more information flowing this year now that Darian Grubb, a long-time Hendrick employee, is Stewart’s crew chief. The sharing of technical information so far hasn’t led to the Hendrick drivers treating Stewart and Newman like teammates on the track, Johnson said.